Registered Louisville Home Builder and Home Remodeler, Carl Baker has been active in the construction and real estate industry since the early seventies. A long-time Louisville, KY resident, he began his career in Florida with General Development Corporation, the state’s largest real estate developer. At 19, he became the youngest staff engineer in the company’s history. Working for General Development, Carl gained significant industry experience and knew he would one day start his own company. In 1989 that dream came to fruition when Carl founded Sterling Development Group Ltd. Armed with more than 15 years experience with some of the country’s most respected builders and developers, including NTS in Louisville, Carl set out to create one-of-a-kind homes that would stand apart from the rest. 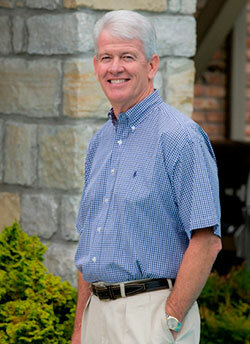 As a top Louisville custom home builder, Carl has dedicated his time to the local building and construction industry through several organizations, including the Home Builders Association of Louisville. He has achieved many professional successes, including becoming a Graduate Master Builder, serving as President on the Board of Directors for the Home Builders Association of Louisville (HBAL), and becoming a Life National Director of the National Association of Home Builders (NAHB). In recognition of his efforts in quality home building he has received many awards, including winning several First Place Homearama Grand Awards. As an active member of the Louisville community, Carl has contributed his time and support to many local charities and organizations. In particular as President of the Board of Directors for the Louisville Kids Center for Pediatric Therapies, which provides aid to children with special needs. Carl and his wife Beth live in Prospect, Kentucky and have four children and five grandchildren. Over the years, registered Home Builder and Remodeler Carl Baker has dedicated his time to the Louisville building and construction industry through several organizations, including the Home Builders Association of Louisville (HBAL). He has achieved many professional successes and has received recognition for his efforts in quality home building and remodeling. With more than 40 years of industry experience and countless awards for timeless, quality design, Sterling Development Group has built a solid reputation as the top Louisville builder for incredible service and impeccable craftsmanship.